Winter is almost over here in Georgia. In just a few weeks we will begin to getting ready for outdoor living. Brightly colored flowers will be planted, mulch refreshed, patios and decks cleaned off for another season of barbecues and outdoor gatherings. Many of you will turn to look at your outdoor metal furniture. Suddenly it doesn’t look as bright as it once did. The colors may have faded, the rust has increased from last year. The good old set is past it’s prime…time to get a new one. Or maybe not. For half of the cost of a new set you can have furniture stripped of all of the old paint and rust and powder coated in almost any color you can imagine! Consider the possibilities that offers. 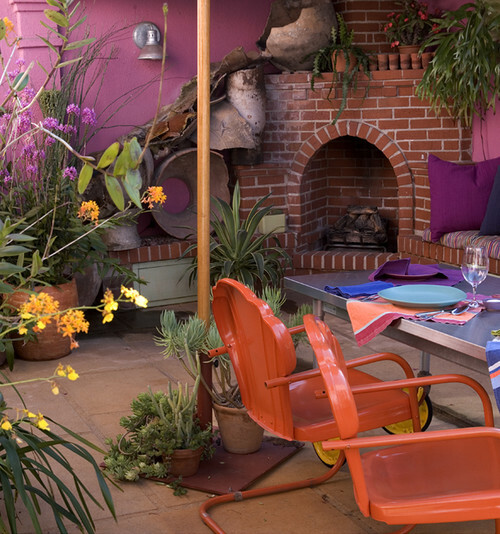 You can create a unique outdoor oasis with splashes of color here and there for an eclectic look. Vintage furniture makes a statement, bringing back styles and memories from the past with a bright new, lasting finish that will take it into the next generation.